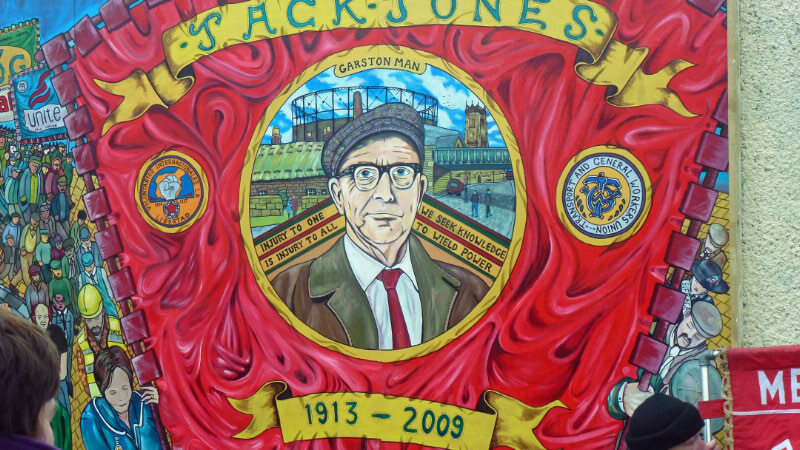 Jack Jones was born in the Garston area of Liverpool in 1913. His birth name was James Larkin Jones, named after the Liverpool born trades union icon James Larkin. Like other working class kids of his generation, he left school at the age of 14. He went on to lead the Transport & General Workers Union. He was dubbed “the most powerful man in Britain.” Not bad for a Scouser who left school so young. His trademark was to close his speeches with a rendition of Keep Right On Til The End Of The Road. He died in 2009, aged 96. 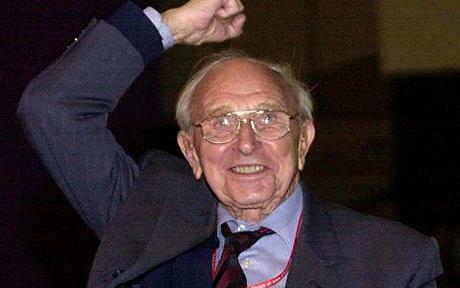 I was fortunate to have known Jack Jones the leader of my union the TGWU for 10 years from 1968 until his retirement. I was a convenor at Fords Halewood when I first met Jack. Then in 1969 we went on strike against a deal that would have given Fords the right to financially penalise workers who took part in industrial action. Jack intervened, supported us and removed and replaced the National Officer responsible. Jack was born in York Street in Garston, Liverpool in 1913. He worked on the Docks, also becoming a Labour Councillor. Influenced by The Ragged Trousered Philanthropist, Jack began his lifelong stance against all forms of inequality. Jack joined the fight against Franco’s Fascists and was wounded in the battle at Ebro. Back home he became an officer of the TGWU, going through the ranks until he was elected General Secretary in 1968. I became an officer in 1970 and was encouraged by Jack’s commitment to make the democracy of the Union really work and have meaning for the lads on the shop floor. Unlike more bureaucratic union officials, Jack supported the growth of the Shop Stewards’ Movement. Jack retired in 1978 and immediately took up the fight for Justice for Britain’s Pensioners, becoming the first head of the National Pensioners’ Convention. Unlike some, Jack had no interest in Knighthoods and titles. He continued his commitment to Socialist ideals until his death in 2009. We wanted to commission a statue of Jack in classic arms outstretched pose outside Jack Jones House Liverpool. His family however believed that Jack would likely have been opposed to this, so to date no permanent memorial exists. When I retired in 2001 after 31 years as a T&G officer a retirement party of which I had no knowledge was arranged. I was surprised and humbled to have had Jack, then 88 years of age, travel from his home in London to present me with the ‘Union Man Statuette’ when he said some very kind things about my time as an officer. In 2013, I was asked to represent the Union at an event that was organised to commemorate the centenary of Jack’s birth. 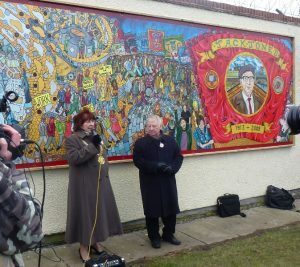 This took place in York Street Garston, Jack’s birthplace, where the people of Jack’s community have produced a large and impressive mural on the street wall, fondly remembering Jack. I had the privilege of making a speech to a well-attended gathering genuinely showing their pride and respect for their famous son inside the old Garston Woodcutters Club. James Larkin Jones, Socialist, Union Man and Son of our City, it was a pleasure and privilege to have known you and to have been able to share your values. You will never be forgotten. A huge thanks to the branches and divisions of UNITE union who helped fund the production, distribution and promotion of the Jack Jones song and the Freedom Rider album it appears on.